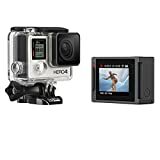 Amazon has the gopro HERO4 silver for $399 with free shipping. Sells for $399+ Highest Price. Deals for $379 Lowest Price. Normally $396+.